AS the pioneer in the open-kitchen concept in Malaysia, Shook! is re-introducing its famous Sunday champagne brunch with an all new whimsical theme and menu, while keeping in line with tradition for hosting the longest running brunch in town. After a revamp which took eight months between May and December 2014, the doors to Shook! have reopened, drawing inspiration from the 1865 English novel by Lewis Caroll, Alice in Wonderland. And the Mad Hatter brunch buffet is nothing short of lavish. The saying spoilt for choice applies fittingly but is also quite an understatement. 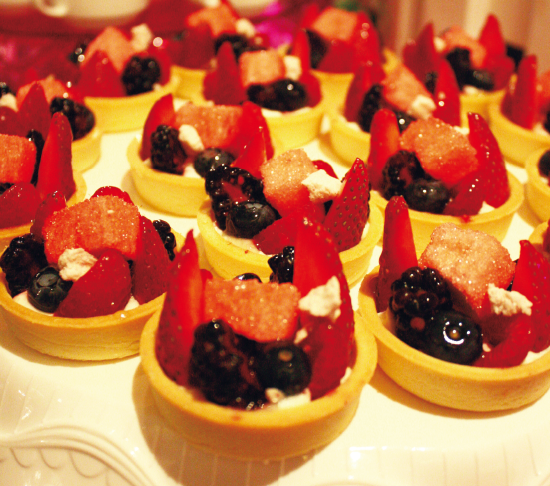 The brunch extravaganza offers an adventurous culinary journey from the Japanese, Italian and local cuisine with a full-on Western grill, a cheese platter section, a bread section, a salad bar, cold cuts, a seafood counter and — not to disappoint fans — a colourful dessert bar to complete the dining experience. The master behind the menu and the quirky concept is executive chef Matthew Ona who is not only responsible for creating, developing, helming and executing this delectable spread but also for his “interactive buffet” idea. YTL Land Sdn Bhd sales and marketing director Paula Conway says Ona wanted patrons to do more than just enjoy the spread. Noodles from the Japanese section are served as appetisers in small bowls. There are also Tempura dishes accompanied with soy sauce, wasabi and pickled ginger in the selection. 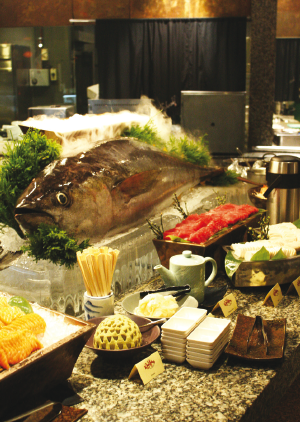 The limelight fell on the impressive sashimi spread which was fresh and appropriately sized for appetisers; apt for those who want to start the buffet on a healthy note. At the Western grill or the live action carvery section, the two must-try dishes are the Whole Marinated Darling Lamb Carcass and the Beef Brisket. The lamb is roasted over a charcoal pit stove and the meat is sliced directly onto your plate. Choose from various sauces to accompany the meat. The brisket is tender and soft and melts in your mouth. The Cumberland Sausage Rope is freshly made, judging by the aromatic taste of herbs. It is all shades of green and Mediterranean-styled sides at the salad bar, enough to make any health conscious patron smile with glee. Shook! ensures there is something for everyone at the salad bar, even for those who are picky about their vegetables. Next to the salad bar is the seafood counter, loaded with fresh prawns, mussels, giant clams and varieties of sushi. 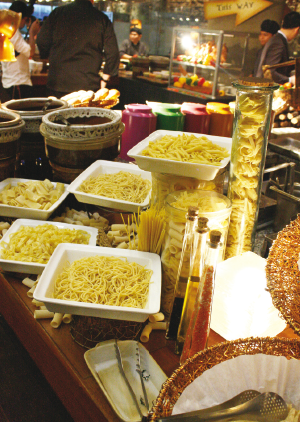 Walk to Italy — the Italian section that is — for an assortment of ready-made and made-to-order pasta dishes and pizzas. The Carbonara sauce wins the award for the best tasting pasta sauce. It is divine and full of flavour. If pizza is your choice, your made-to-order dish is served in less than six minutes. The cheese platter section is easily a dream for cheese lovers as it houses every type of cheese imaginable that comes complete with various crackers, grapes and dried fruit condiments. The dessert bar is a sight for sore eyes, even if you don’t have a sweet tooth. Whimsically inspired desserts from Red Velvet Pillows, Pot Au Chocolate, Hatter Cake Pops, rainbow-cake and a pink chocolate fountain with fruits and homemade marshmallows deck the front of the bar. There are also meringues that are made to look like quirky mushrooms. They are light and not too sweet. The Hatter Cake Pops are probably the most mouth-watering dessert. The “pop” in the cake is the caramel-filling guaranteed to send you “oohhhhing” and “aahhhing”. Also, the traditional English pastry, the Bakewell Tart makes an appearance in the dessert bar. So if you’re looking for a weekend treat for yourself, you might want to follow the white rabbit to Shook! and be a part of this extravagant feast to try everything that might not even say “Eat Me!” or “Drink Me!” — in this case a free-flow of Moet & Chandon bubblies. This article first appeared in The Edge Financial Daily, on January 28, 2015.